It's my 50th blog post! 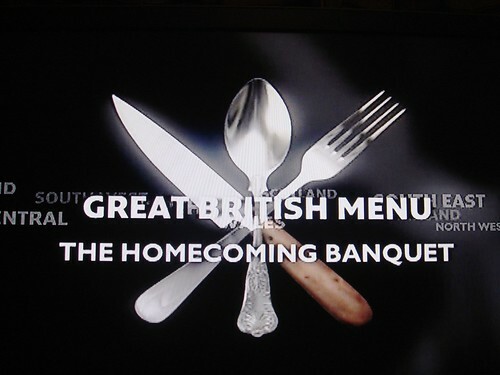 To celebrate, here's the moment we've all been waiting for - The Great British Menu 2009 Homecoming Banquet! With your host - Ross Kemp! (though she's not actually invited to the event itself, ha). 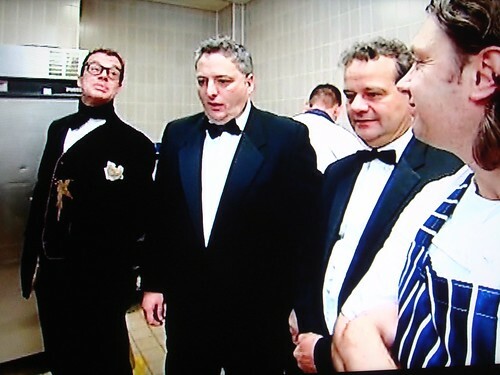 The chefs Kenny Atkinson, Shaun Rankin, Nigel Haworth and my fave, Glynn Purnell arrive at RAF Halton House the day before the banquet - the latter two have rather sweetly driven themselves down. 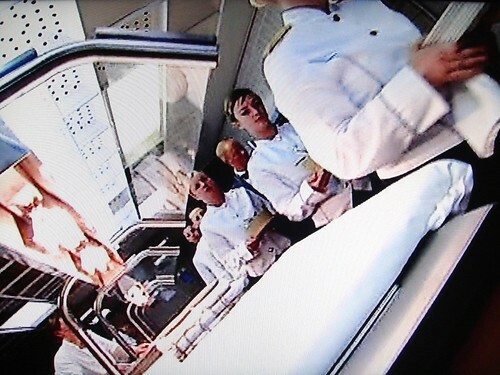 There's some flashback action, with scenes of Kenny dressing up like Tina Turner in combats, and of Glynn being patronised in a Brummie spice factory - "We Have. To Grind. Them Sloooowly. Or they. Will Get. Burnt". THE SLATES ARE TOO SMALL! 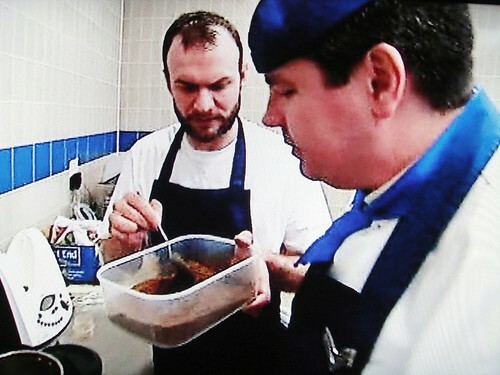 Glynn then checks out the black plates that he'd chosen so carefully to make his monkfish "pop" and guess what? THE PLATES ARE TOO SMALL! THE CREAM IS TOO THICK! Thus Jennie Bond ramps up the artificial pressure, stuck in a booth with only a mike for company, intoning "This time tomorrow, the first course must be served". 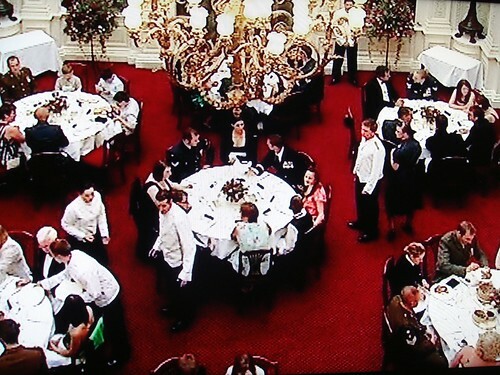 Whatever, Jennie - the chefs seem quite happy just having a casual bevvie. Meanwhile Sgt Max Wall (no, really) is giving last minute instructions to the trainee stewards who will be acting as waiters for tomorrow's homecoming banquet. They're all about 12 years old. My husband suggests they'll be paid in Wham Bars. Suddenly it's the day of the banquet! 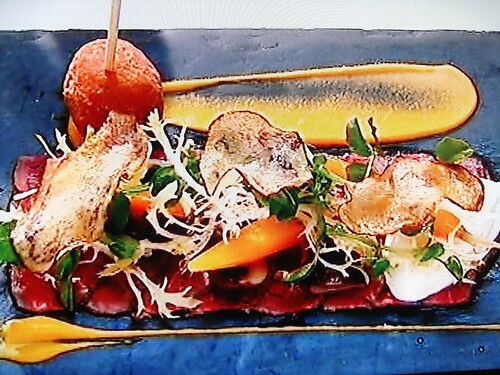 Nigel Haworth explains that everything is going to take some time because they're paying such attention to detail - I barely hear him as the girl beside him takes a minute to peel one side of a potato. 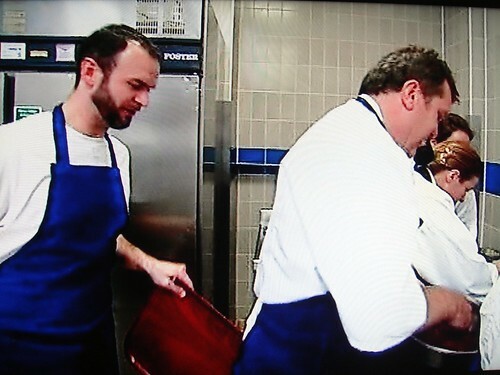 It sounds like they're playing the theme to Charlie's Angels as Kenny begins to sear his Massive Meat Logs (TM). 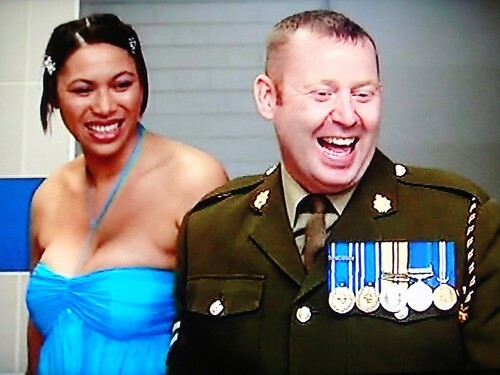 Anyway, the guests will be arriving soon and a surprise diner will be Kenny's brother Mark, who's been in service since he was 16. 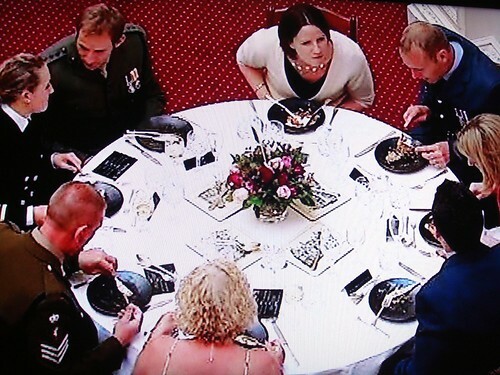 The other guests have been chosen from over 8,000 servicemen as being most worthy of attending the banquet and this will be a real treat for them compared to the grub they normally get on the frontline. Even better, their families have also been invited which is genuinely touching. Meanwhile Glynn is "entering a critical phase". He's blending the spices for the curry but it's been whizzing too long and gah! That dude in the spice factory was totally right. 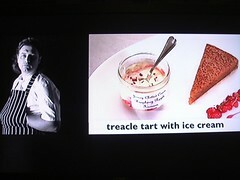 Back to Shaun Rankin and Jennie deals a harsh blow when she says "Making just one tart stretched Shaun to the limit". Miaow. And next - the judges have arrived! 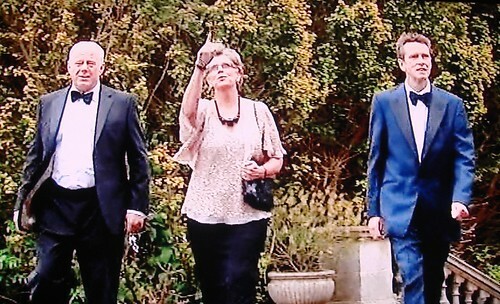 Matthew Fort is impeccable in black tie, Oliver Peyton's tried but his black and blue suit makes him look a bit like a clown and Prue Leith - Prue, love, you could have made more of an effort. Where's your bleeding ballgown? 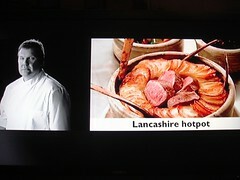 Back to Nigel who's busily constructing 32 Lancashire Hotpots. He's worried because Hotpot is a common feature in ration packs, and Matthew Fort says "In the past, they only had to please three of us. Now they have to satisfy over 100". Drinks and canapes are being served to the guests who have started to arrive. 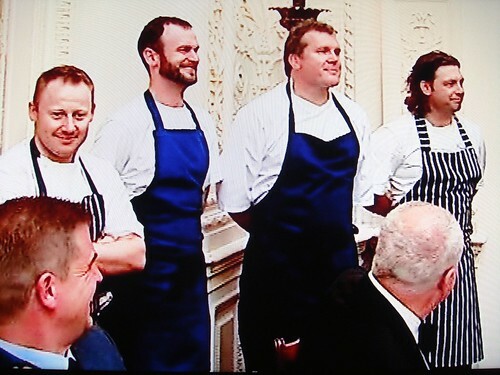 Amongst them are previous winners Jason Atherton, Bryn Williams, Richard Corrigan, Mark Hix, Marcus Wareing and Jeremy Lee (who is looking rather flamboyant). They all pop into the kitchen to visit our chefs. Kenny's prepping the starter - because of the smaller slates, he's going to have three fewer slices of beef on each, but they'll be thicker to compensate. Will the guests be satisfied by this or will there be blood? (God, I'm turning into Jennie Bond now). Ross Kemp comes in to say "Hello, I'm Ross Kemp". Time's ticking away when surprise guests Mark Atkinson and his lady also drop in on Kenny. 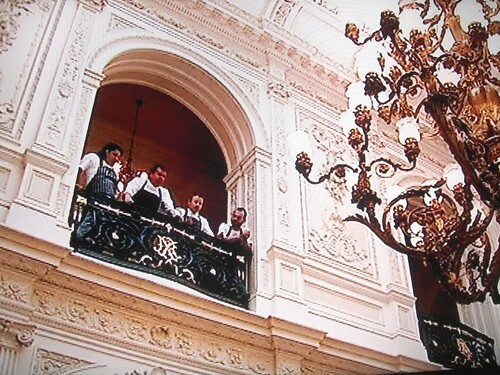 Kenny says to his brother "You look very smart" and Mark teases "And you're covered in carpaccio". Ooh, he said the "C" word! 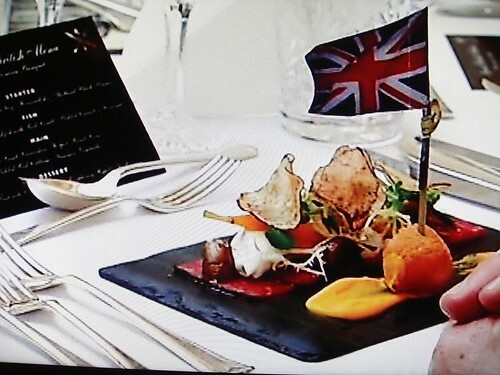 Matthew Fort also doubted the provenance of Kenny's starter, so he's determined to prove him wrong by planting a Union flag in Matthew's portion and asks the waitress to take it to "The old man with the grey hair". Soon all the starters have been served and they've been lapped up - and what's the verdict? 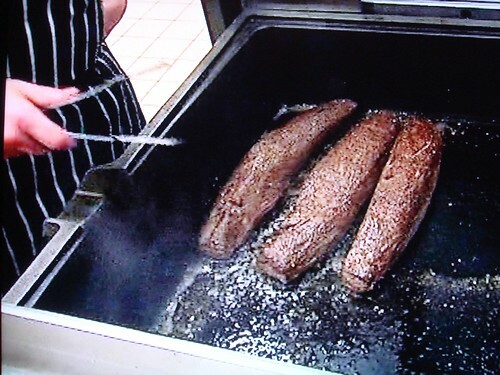 Mark Atkinson is delighted at the first food that his brother has ever cooked him (in 30 years!) and when Kenny goes out to see him he admits that it's true. Another chap says "It's amazing the taste you could have on a small piece of someone's roof". 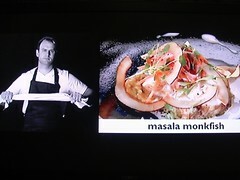 Glynn's fish course is next and Olive Peyton says over-excitedly "This is a pivotal moment in British cuisine - curry going out at an event like this - the world is going to explode". Hmmm. Glynn's just excited by being surrounded by lots of beautiful women - he says "Cheers Chief!" 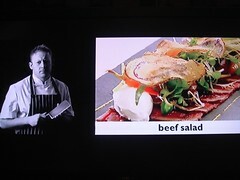 - a reference to mentor Sat Bains. Again, the portions are smaller but they're polished off quickly - one guy laconically says "I like fish. I like curry" (but which is better?). 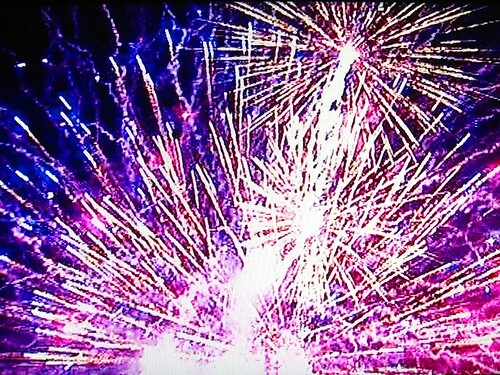 Best comment of the night however is "The aroma coming from it completely captures Birmingham". 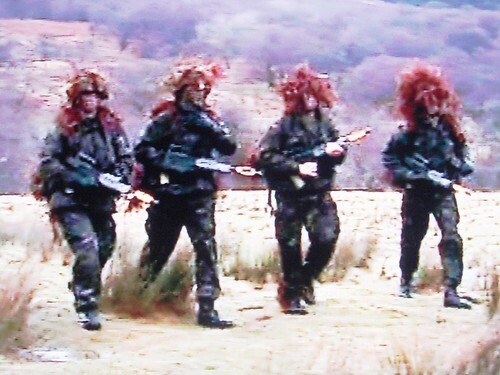 Glynn also goes out to greet the troops and have his photo taken with them. 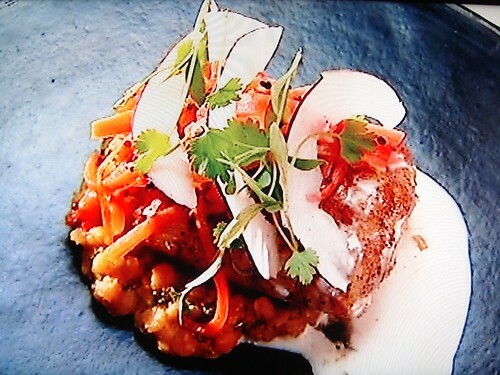 Meanwhile, Oliver's still frothing at the mouth when he says "This is a completely unique dish! You will not find it in India! Its spicing is completely British!" Methinks he gone cuckoo. 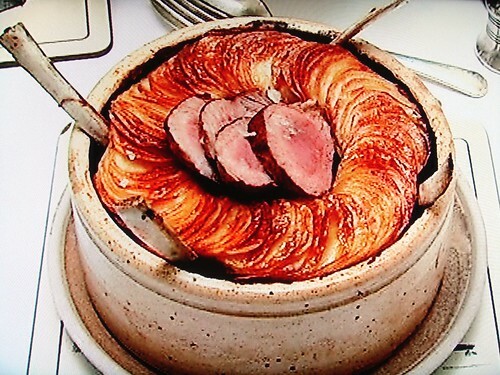 It's time for Nigel's main course Lancashire Hotpot. 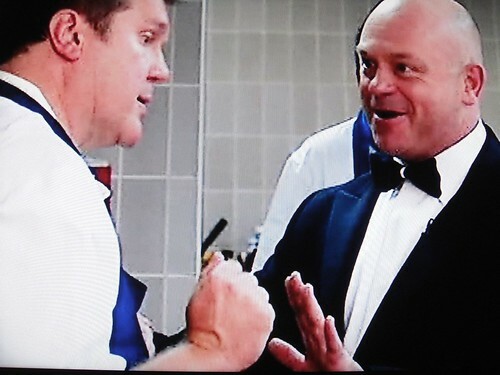 Ross Kemp comes in to offer words of encouragement - looks like it might kick off. 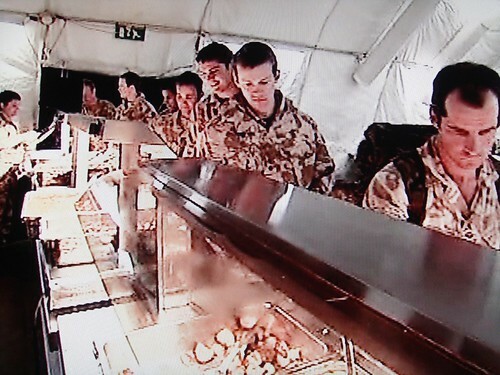 Nigel needn't have worried about his dish being over-familiar. Everyone's delighted at being able to help themselves and they can't get over how much better it is than the stuff they usually call hotpot. When Nigel goes out to say hello, at least four separate women, and Jeremy Lee, literally throw themselves at him. The guests are ready for dessert now, but because Shaun's been fannying around, nothing's ready to serve, despite the tarts being cooked a while ago. All the other chefs muck in to get it ready, but they're all demob happy since their courses are done, and Glynn a little more than the others as he first attempts to wedge a tray between Nigel's buttocks (seriously) and next eats one of the ice creams, even though not all the guests have been served. Naughty but I'll forgive him - I even forgive his earring (though usually I hate them on men) because it makes him look like more like a pirate than a prat. 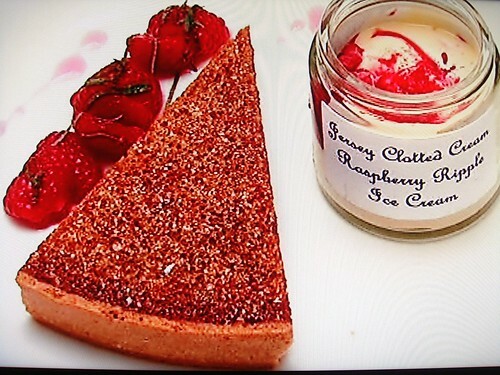 Finally every last dessert has been sent out and consumed and adored and it's all over. 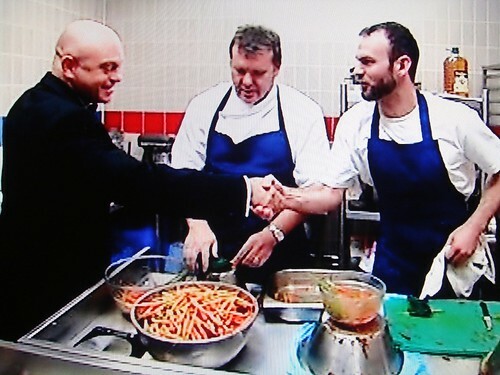 Ross Kemp calls the chefs out to thank them for their efforts. 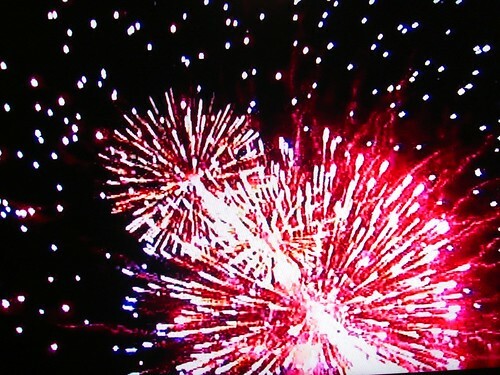 Everyone applauds and they all troop out to a stunning firework display. 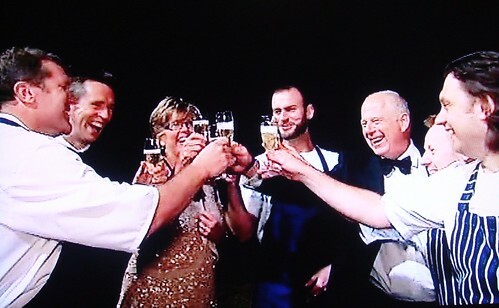 As they watch the fiery flowers explode in the sky above, Prue, Oliver and Matthew gather our chefs and toast their success with champagne. It's a fitting finish to a fantastic occasion - the boys did us proud. 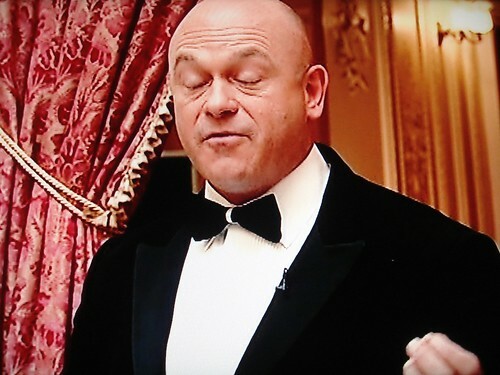 I was still reeling from the first image of Ross Kemp when you had to go and mention Annabelle Chong, now I'm traumatised! Brilliantly funny post. I'm off to check out Ross' website now. Glad I recognised Annabelle Chongs name before I clicked on it. your review is keeping me highly entertained! Glynn Purnell is my favourite too!! It's his accent. 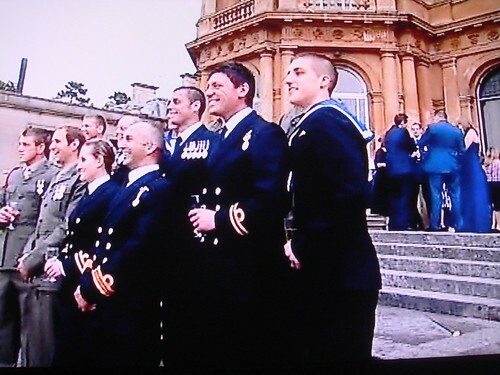 I thought it was a brilliant tribute to the brave men & women of our Armed Forces & I am proud to have served alongside them. @Boo - did you go to his website? Is your life the same now? I was one of the 12 year olds on this it was a very special event to work and this made me howl with laughter. WELL DONE!